Is anyone able to help me identify the reason why my computer continues to BSOD? I did a pretty large upgrade recently, chipset to haswell, 16 to 32gb of ram, gtx580 to gtx680 classified, 850w to 1000w psu, added new case fans, got an h80i for my cpu. That being said, I'm not sure where to start. I've checked airflow and temperatures, I don't believe it has anything to do with that. H80i is preforming well, case fans are moving air nicely through my HAF X case, and the fan on my GPU is confirmed spinning. I've gone through my wiring completely ensuring everything is properly connected. I have reseated my RAM to ensure it was working properly. GPU has been removed and reseated, and any non essential periphs have been removed. Here is a WhoCrashed report of my last half dozen BSODs or so. 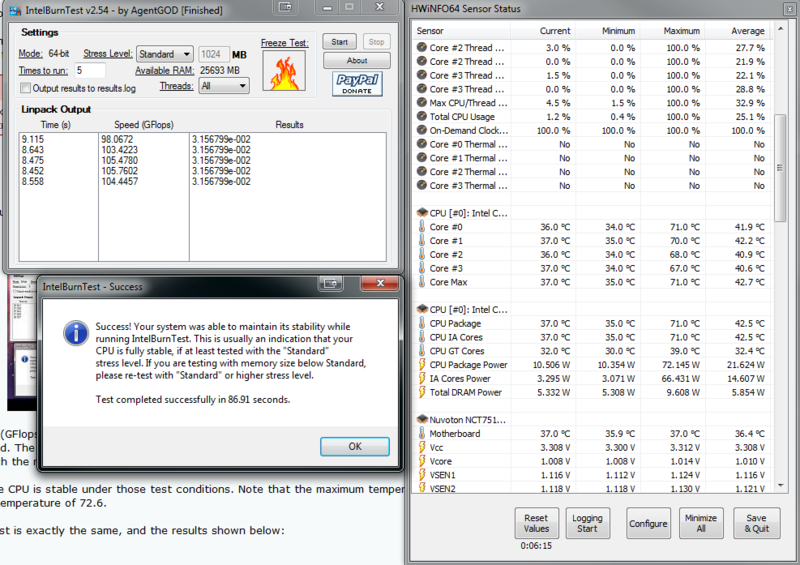 I began running a basic stress test on my CPU, and very quickly saw my CPU temps approach their maximum (72C). If my CPU is hitting max load under stress, is it safe to assume that is the issue?